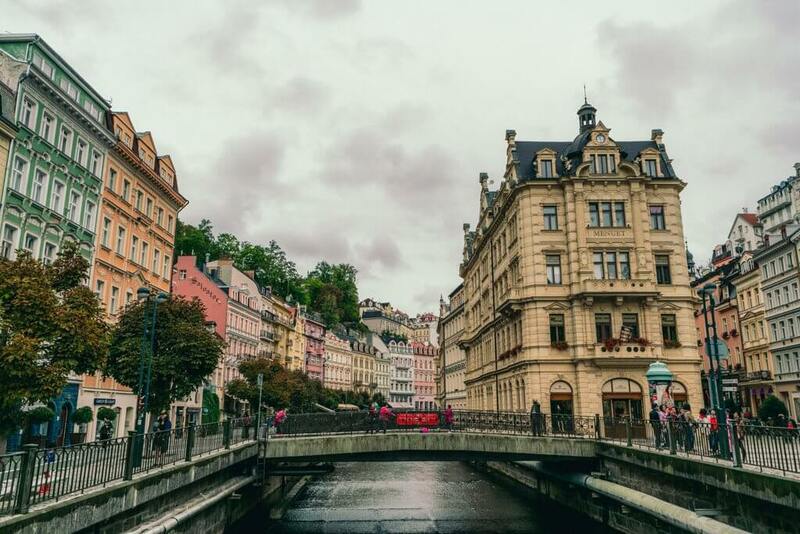 Karlovy Vary a place full of opulence, luxury, and wellness has gained fame over the past few centuries as being the go-to getaway for healing and relaxation. 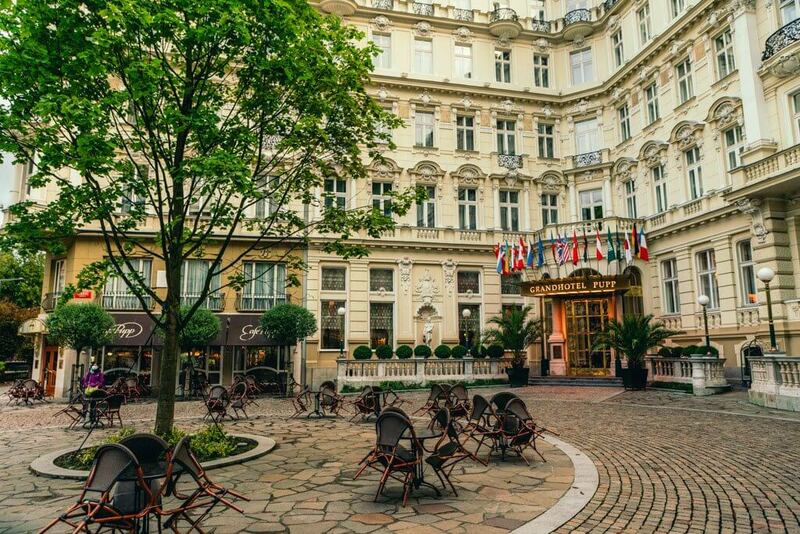 Karlovy Vary, often known as Carlsbad, has attracted famous people throughout history such as Mozart, Beethoven, Freud, Casanova, and even big movie stars today during their annual film festival for ultimate wellness. However, you do not have to be a celebrity to enjoy or experience the glamour and healing characteristics of this enchanting city. Anyone can visit and enjoy the curative powers of the city. Afterall, taking a vacation is good for your health and reduces stress why not double down and take your next vacation to a world-renowned spa town? 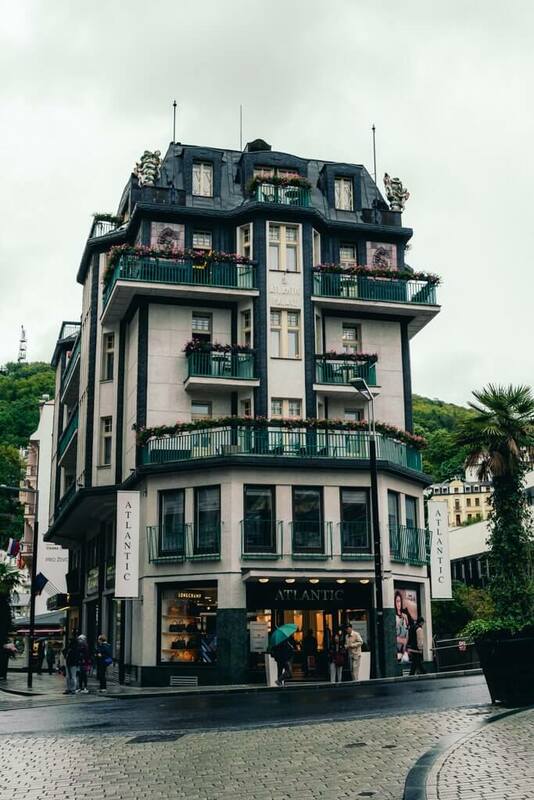 Here is why you need to make a trip to the spa town of Karlovy Vary your next gift to yourself. The hot springs were discovered with Charles IV during a hunting expedition and since have become famous and drawn crowds for the springs healing properties. 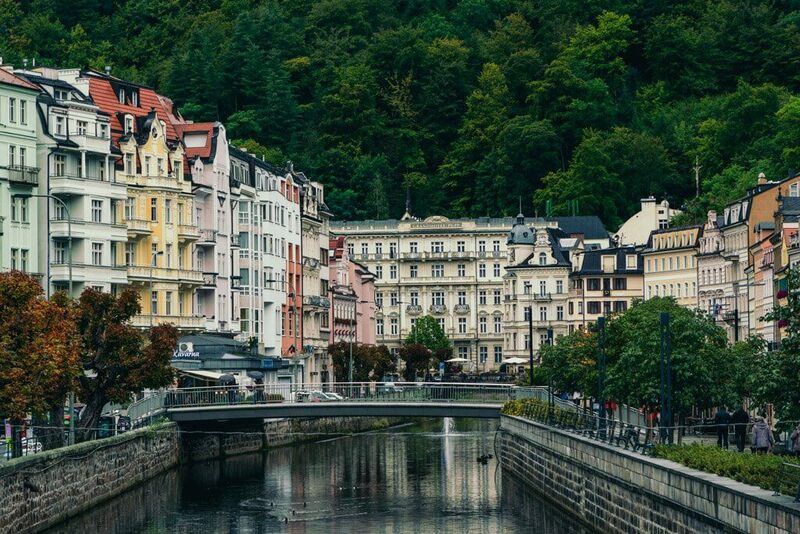 There are 79 hot springs discovered in Karlovy Vary and 13 can be visited by strolling through each of the colonnades in town. The five colonnades are known as Vridelni, Zamecka, Trzni, Mlynska, and Sadova or Hot Spring, Chateau, Market, Park, and Mill Colonnades. 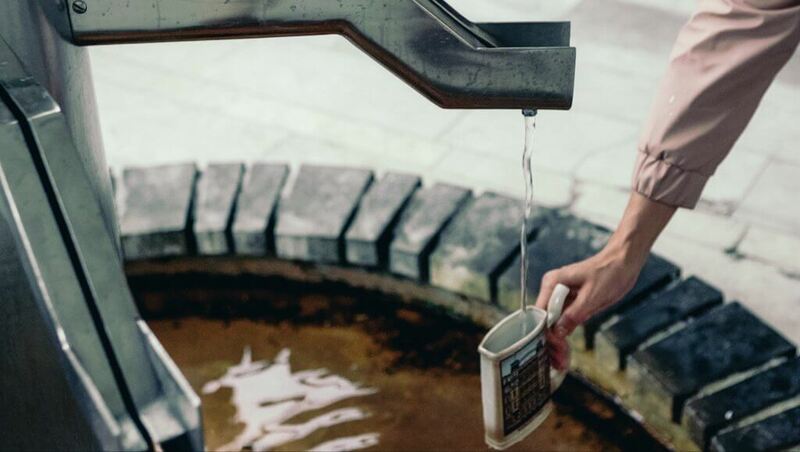 The springs located inside the colonnades are used today for internal and external healing and therapy by locals and visitors and vary in temperature. You can also visit one of the many spas and wellness centers within the city for treatments, some of which have outdoor swimming pools with excellent views. The different treatments offered vary from spa to spa, but the most common are baths using the spring water for muscle relaxation, baths infused with carbon dioxide for strengthening the immune system, blood circulation, and calming the muscles. Also, body wraps with carbon dioxide increase oxygen in the bloodstream as well as improved circulation. Massages and hydrotherapy sessions are also very common at all of the spas. Walking through Karlovy Vary you’ll notice people carrying around a small porcelain cup with a spout and handle. You will want to purchase one of these at many of the gift shops or even your hotel for the natural mineral springs internal healing treatment. Walk through the colonnades and sip on the mineral water from the different springs. Each spring is said to have its own healing properties and vary in temperature and people have been using this treatment since the 16th century. People have sipped on the mineral springs to help their digestion, metabolism, and even musculoskeletal system to name a few. 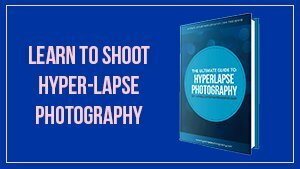 The cooler temperature waters are said to have more of a laxative effect where the warmer temperatures have a calming effect on the stomach. Be ready though, the mineral water has a strong salty taste and is meant to be consumed in small portions. Do not overdo it as you could work against yourself and make yourself sick instead of better. Locals who have been using these curative mineral water’s powers for years can consume up to 1-4 liters per day. However, if this is your first time take it easy and just try a few sips from each spring and pace yourself. We were told that if you consume too much you can give yourself diarrhea or even worse breakout in hives. We were fine, but we did sip in moderation. 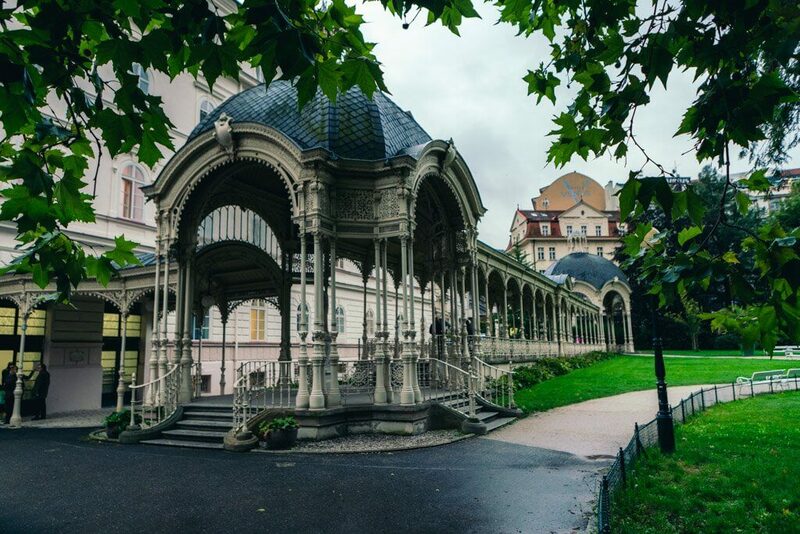 As mentioned before, there are five major colonnades in Karlovy Vary in which you can find most of the springs to sip mineral water from. 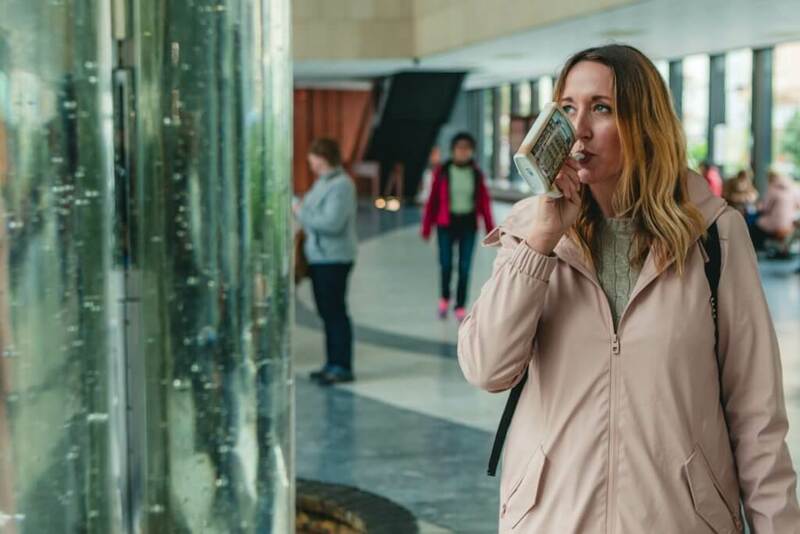 The colonnades themselves are magnificent to look at with beautiful architecture and each is worth visiting to admire and try a few sips of the curing waters. 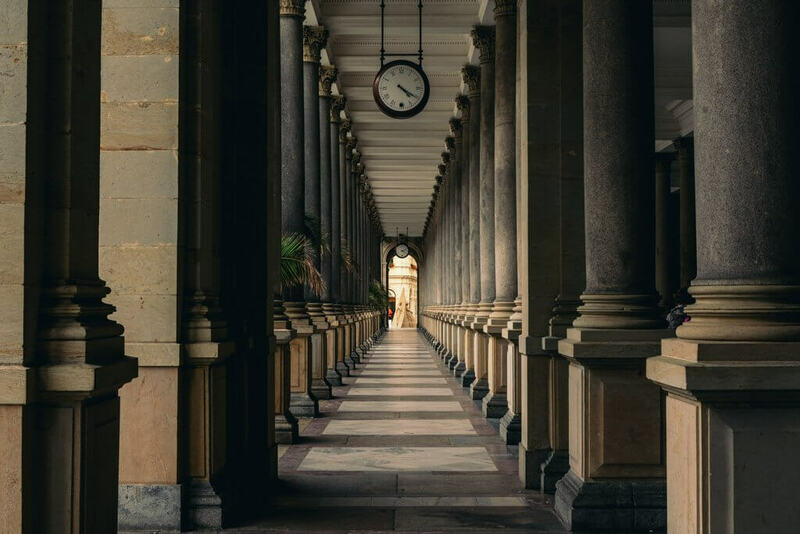 The Mill Colonnade or Mlynska is the most impressive and easily recognizable colonnades in Karlovy Vary. Its architecture is Neo-Renaissance and contains the most springs of any of the other colonnades at 6 total. This is also a great place to take photos, the inside and outside are incredibly picturesque. We especially loved the nave with the clocks. The Park Colonnade or Sadova is another impressive and intricate architectural structure made up of cast iron. This colonnade is home to three different springs including the popular snake spring. 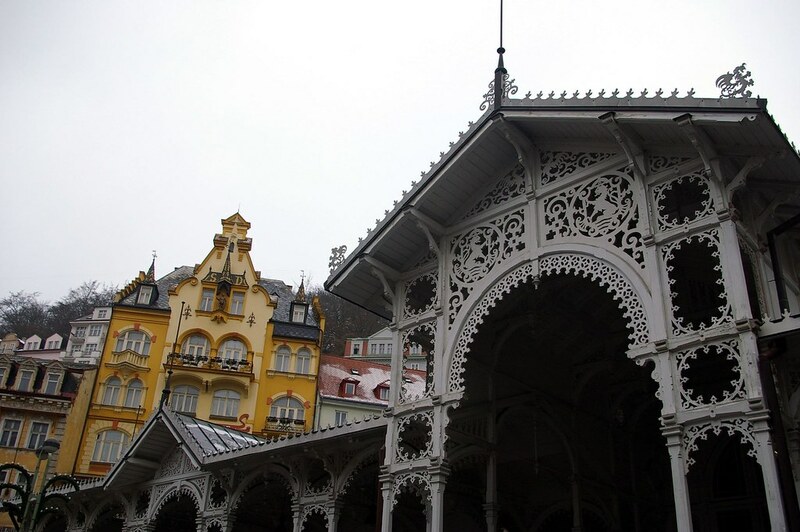 The Market Colonnade or Trzni is a beautiful Swiss style structure made of wood. It was under restoration and construction during our visit, but you could still see some of the beautiful details in the woodwork. There are two springs inside including the Charles IV spring and the Market spring. The Castle Colonnade or Chateau is made up of stone in Art Noveau style. The entire colonnade is not accessible and only contains two springs, the upper and lower springs. We sadly missed this colonnade during our brief visit to Karlovy Vary. Hot Spring Colonnade or Vridelni is a modern structure built between 1969-1975 and pumps out the most mineral water at once at a rate of 2,000 liters per minute. The indoor complex has 5 different areas where you can try the different hot springs and is a good place to purchase your drinking up and one of the local spa wafers. You can recognize the hot spring colonnade not only by its modern look but also by the steam and hot spring fountain spurting water outside. There are also plenty of places to take a rest and sit for a bit as you sip on your mineral water here as well. 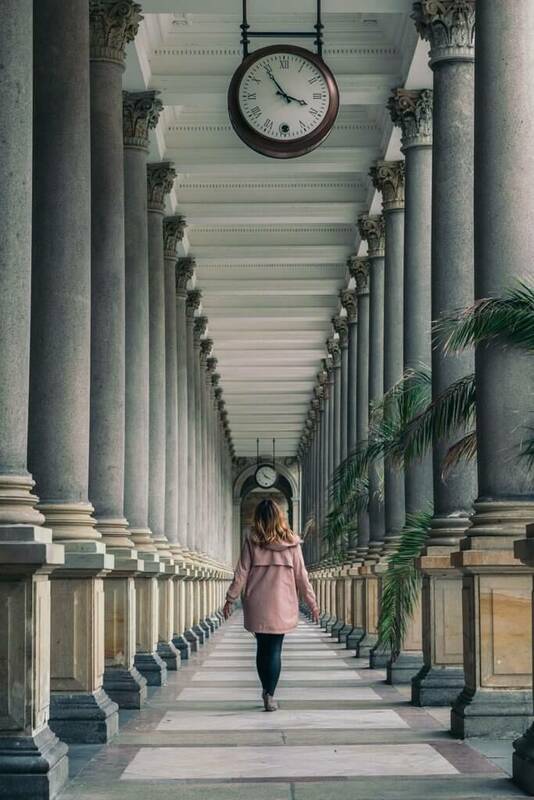 Besides the beautiful colonnades, the entire city of Karlovy Vary is full of opulent and extravagant architecture from every spa, hotel, and building present. 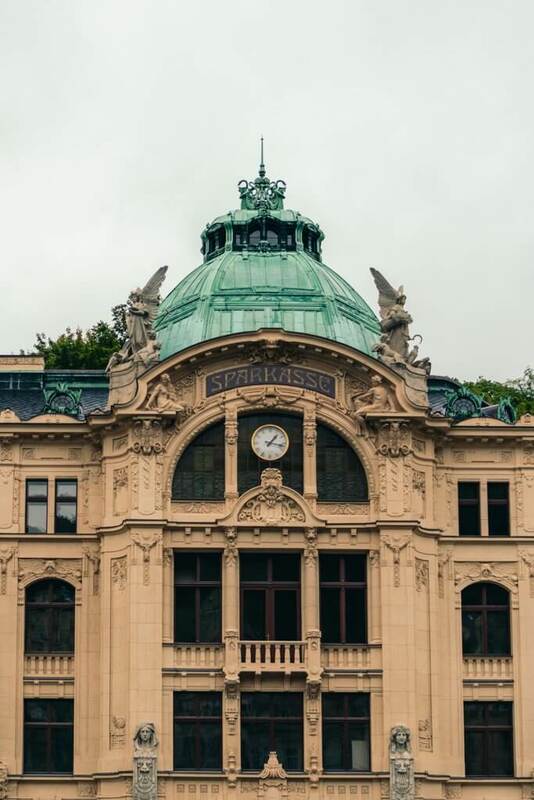 The exquisite buildings are a blend of Neo-Renaissance, Neo-Classicism, Neo-Baroque, Art Deco, and Art Nouveau styles and are as eye appealing on the inside as the outside. You feel as if the entire town was built only for noblemen and the wealthy just by appearance. You can’t help but be in awe by the beauty and elegance of the entire city. Luxury and designer shopping goes hand in hand with a city full of extravagant architecture and lavish spas. The streets lining the Tepla River are full of shops containing designer apparel, fur jackets, leather shops, and anything frilly you can think of. 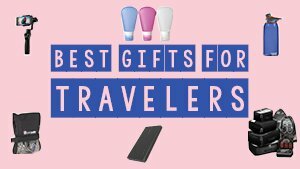 You can also find plenty of locally run cosmetic and skin care stores featuring everything from beer infused skincare to Karlovy Vary mineral salt skincare products. For those not able to afford the designer labels there are other options for shopping at a shopping mall near the city center with brands like H&M. We love discovering that we are visiting famous shooting locations for some of our favorite movies. Two popular US Blockbuster movies filmed in Karlovy Vary include Casino Royale featuring Daniel Craig as James Bond and The Last Holiday with Queen Latifah. While we haven’t seen The Last Holiday we may be inspired to do so just because we find it fun to watch the films in places we have been. We were most intrigued with 007 being here in Karlovy Vary. The scenes filmed in Casino Royale were the Montenegro scenes in the film. They filmed at the Grand Pupp Hotel and the former Kaiserbad Spa just next door including some shorter scenes around town. We ended up splurging for a date night and enjoying a dinner in the same restaurant and almost same table location as James Bond in the Grand Pupp Hotel after he wins back all of his money gambling in the casino. This is a fun experience if you’re a Bond fan! 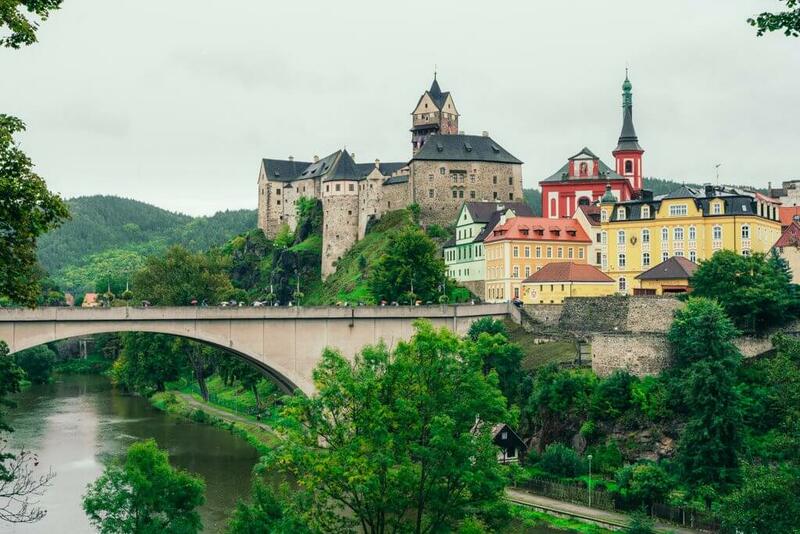 More scenes in Casino Royale were filmed in the nearby medieval town of Loket, which is also worth a visit. 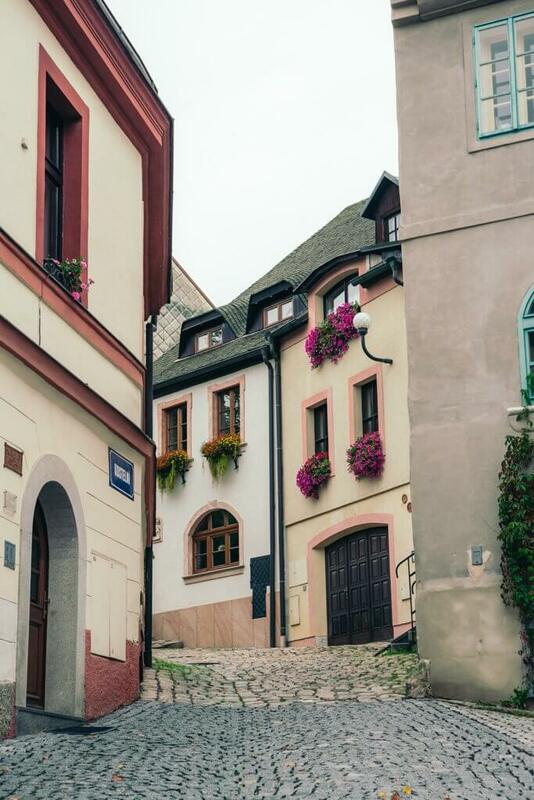 Give yourself enough time for Karlovy Vary to also visit the small, medieval town of Loket nearby. 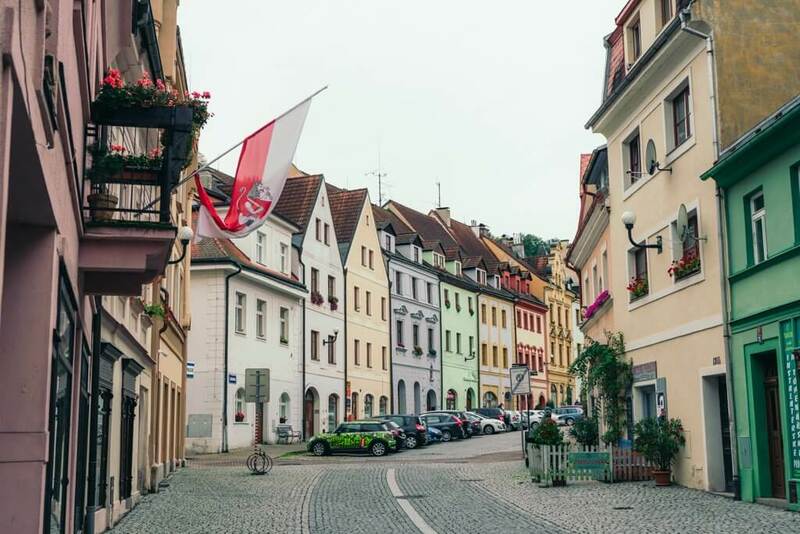 Only a 25-minute drive or bus ride from Karlovy Vary this is a sensational little town you don’t want to miss. We only needed a few hours to explore one of the oldest stone castles in the Czech Republic as well as the delightful city center. We were reminded a bit of Cesky Krumlov as the Ohre River wraps around the city in a similar way. 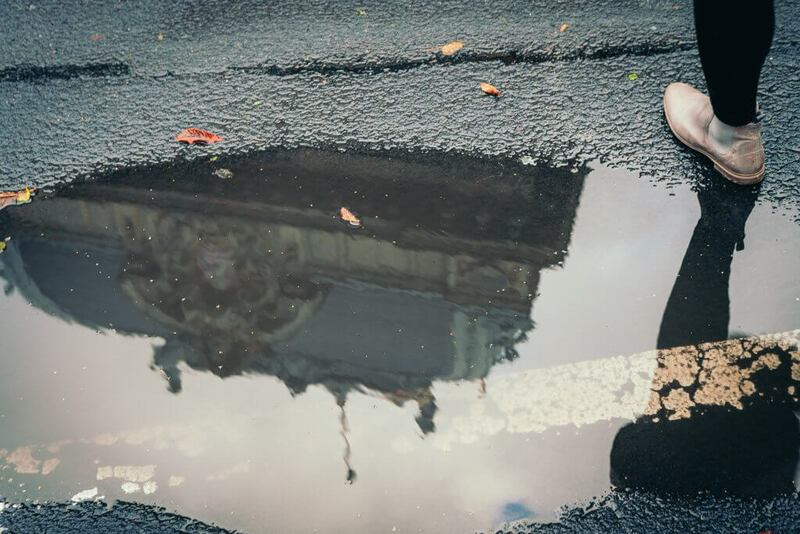 We were a bit bummed it was raining and we couldn’t pop up our drone for a lovely aerial shot. You can self-guide your way through Loket Castle by weaving your way through the chambers, rooms, dungeon, and ramparts. There are interesting artifacts inside and the torture chamber section will give you the chills. As you’re walking around the castle perimeter you can visit the Black Tower for free and take a peek at the goats that live along the outside of the castle walls. While visiting the town center you can witness the spot where James Bond famously parked his Aston Martin. The restaurant next door Goethe is where Bond and Vesper met Matthis. Be sure to enjoy a delicious lunch at St. Florian Brewery before heading back to Karlovy Vary. 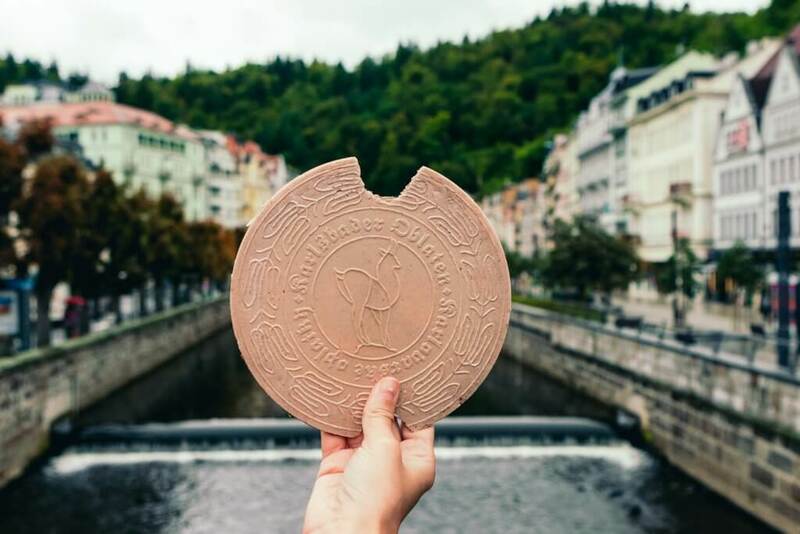 You can’t leave Karlovy Vary without trying one of the local spa wafers! The wafers come in a few different flavors and can be easily found in the colonnades for next to nothing. We tried the chocolate one and it was delicious! The wafers were given to guests of the spas and had a unique flavor thanks to the local mineral water and salt. They have become popular and a must try experience for those visiting the area! 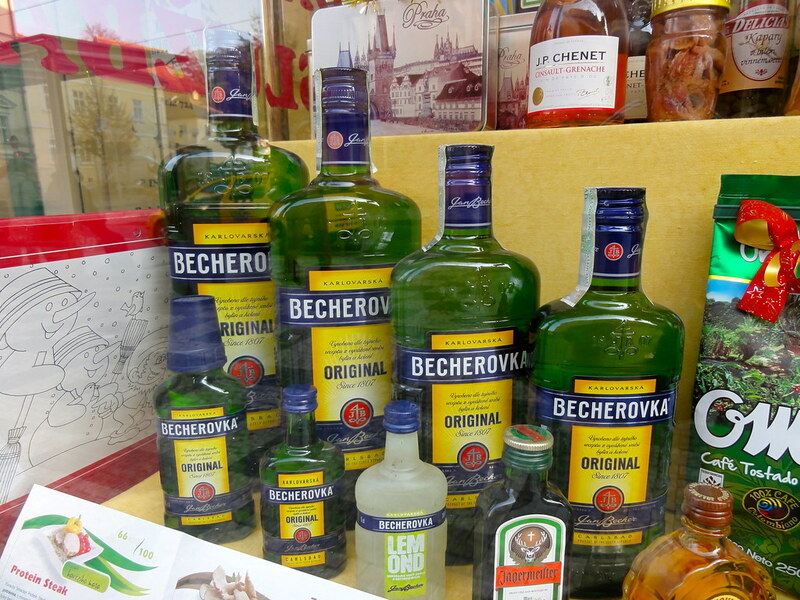 Another must-try item in Karlovy Vary is Becherovka. This herbal spirit originates in Karlovy Vary and is used not only as an alcoholic drink but as a digestion aid and is said to be better than cough syrup! Becherovka is surprisingly easy to drink and has a unique gingery cinnamon flavor. We ended up loving it so much we ended up buying ourselves a bottle at duty-free on our way out of the country at the airport. We will be sure to get a bottle next time one of us has a cold! 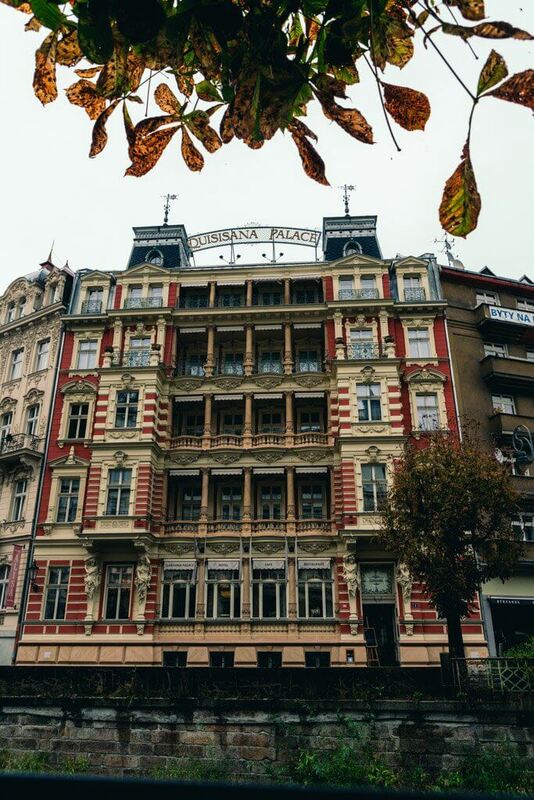 We recommend staying at one of the luxury hotels during your visit to Karlovy Vary. We stayed at Quisisana Palace directly across from Grand Pupp Hotel. Our room had an incredible balcony overlooking the river and the famous scenes where Casino Royale was filmed! The rooms were luxurious complete with a fireplace and chandeliers. We didn’t want to leave. The best perk to staying at Quisasana would be their private spa you can reserve for up to two hours while staying at their hotel. 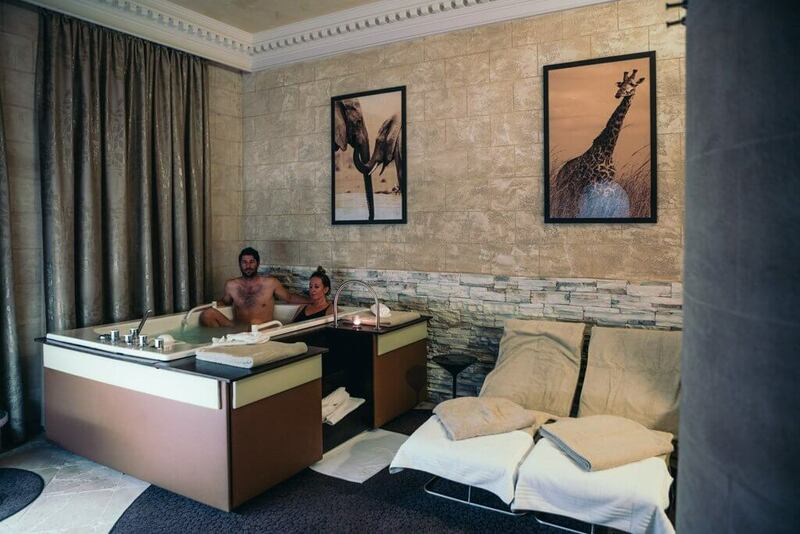 The spa is prepared with a temperature controlled tub with spring water, steam room, sauna, shower, lounge chairs, citrus water, and tea for the ultimate private relaxation experience. This was the perfect cure after hiking the past few days in Bohemian Paradise and Bohemian Switzerland. 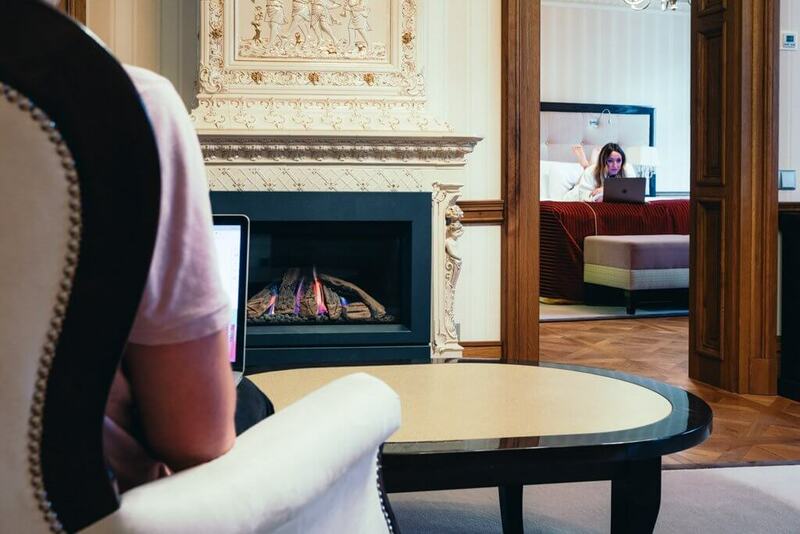 We booked our stay through Amazing Places, a local company that helps visitors find unique hotel experiences during their trip to the Czech Republic. Feeling stressed or need a relaxing getaway? 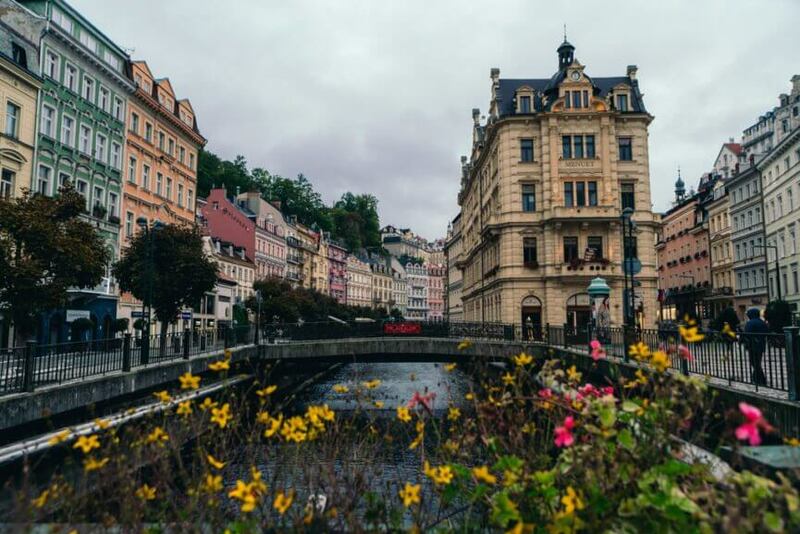 Book your next vacation to Karlovy Vary for the ultimate healing getaway. 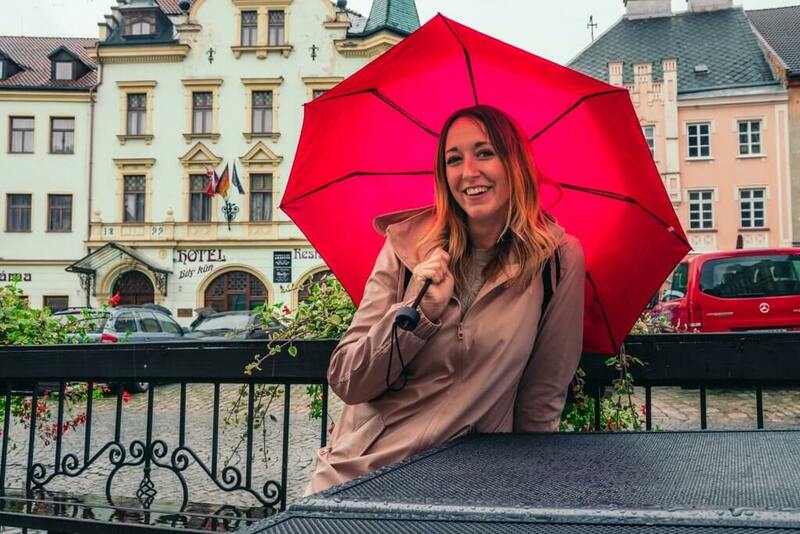 We thought the mineral springs and spa town of Karlovy Vary was one of the most unique things to do in Czech Republic, see what else made our list!